Taking the Casio Pro Trek PRW3500T-7 to extreme places and testing it against precision instruments. Tackling high places with the Casio Pro Trek PRW3500T-7. With most people swapping out their watch for time keeping on a smart phone, we often forget that a timepiece is not only a way to make sure you make it to your next meeting, it is a tool to make sure you make it home. I had my first experience with Casio watches in the early 90s while participating in an intensive wilderness leadership program. My Seiko dive watch fogged over and was unreadable. I asked a fellow student how he liked his Casio G-Shock. The man took the watch off his wrist and threw it as hard as he could at a brick wall…not a scratch! The man said it was bombproof, and it was (is). 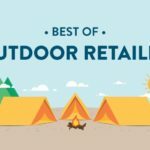 So I was intrigued to test Casio’s latest foray into the outdoor expedition market and put the three sensor Casio Pro Trek PRW3500-7T to the test. The Casio Pro Trek PRW3500T-7 features tough solar power and three sensor technology. This means that lifesaving and navigational features are more accurate and are continuously powered. That’s right, you don’t have to worry about batteries or if your altimeter will lose power while peak-bagging. The Test. 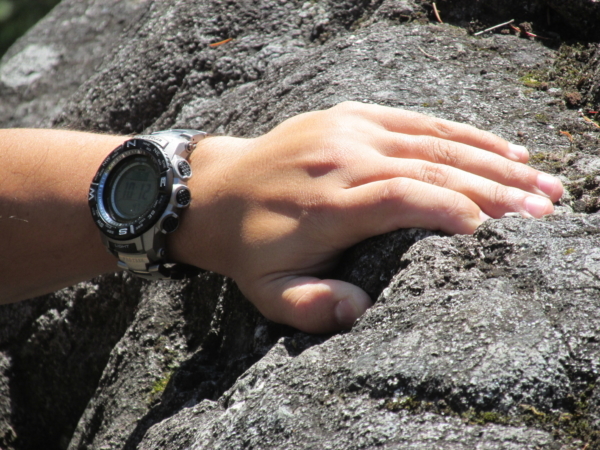 To test the durability and functionality of the Casio Pro Trek PRW3500T-7, I took the watch on a recent climb on the nation’s premier alpine climbing test laboratory – Washington State’s Mount Rainier. 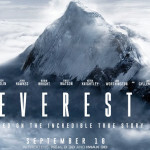 In the mountains, accuracy of navigation and decision making technology can mean the difference between life and death. In addition, the tools you are using have to be robust to extended power challenges, extreme weather, and physical abuse. Functionality. The expedition features of the Casio Pro Trek PRW3500T-7 include an altimeter, barometer, and compass. 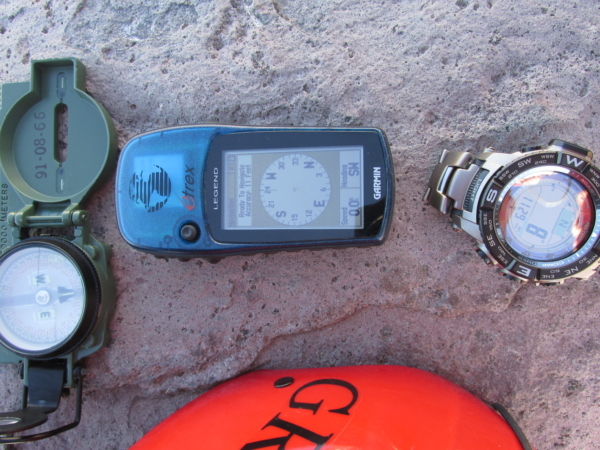 To test the accuracy of the altimeter, I compared the Casio Pro Trek PRW3500T-7 data on ascent and decent against a Garmin GPS and a German made climbing altimeter. 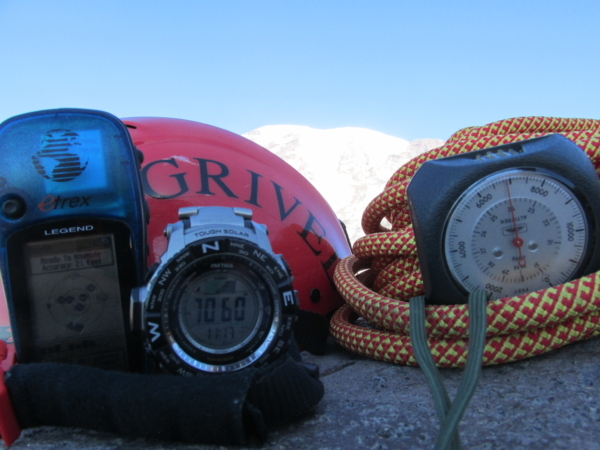 I indexed the Pro Trek and German altimeter to the surveyed benchmark at Paradise. The GPS altitude was low by 60ft from the benchmark. Over the next several hours and thousands of feet, I repeatedly check the altitude of all three instruments. What I found was that the Casio Pro Trek PRW3500T-7 had the least amount of swing in altitude readings than the other instruments, generally indicating more accurate functionality. The other instruments would be either significantly high or low compared to the other two. 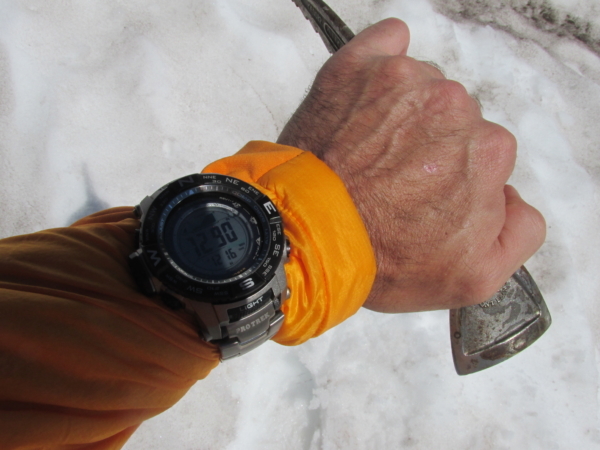 The Casio Pro Trek PRW3500T-7 tracking elevation gain while glacier traveling on Mount Rainier. The barometer function gives both a reading of barometric pressure and a graphic that tracks the barometric pressure over the period of your climb. The barometer was checked against relevant weather data and found to be very accurate. In addition, the tracking graphic was great for quickly seeing the weather trend and helping to make weather related climbing decisions. The temperature reading was accurate within 10 degrees, but was often influenced by body temperature. The compass function was checked against a military grade lensatic compass. The Casio Pro Trek PRW3500T-7 user manual alerts the user that the compass is only accurate to +/- 11 degrees. I found this degree range unacceptable for wilderness navigation. During the test, the watch displayed azimuth directions dramatically different from the lensatic compass. The watch compass was also slow to react to changing directions of the user. Where the compass feature could be helpful is as a back-up compass to indicate general direction. I always believe in the redundancy rule when in wild country, I would trust the Casio Pro Trek PRW3500T-7 to point me in the right cardinal direction if my primary compass became inoperable. 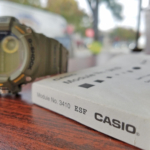 The Casio Pro Trek PRW3500T-7 compass test. The Band. This model of Casio comes with a metal watch band similar to popular high-end dive watches. A problem I encountered is that the watch needs to be uncovered to allow the sensors to operate properly and for the best accuracy. However, if you adjust the band for your wrist, it is unlikely to fit over layered clothing (like a puffy or a parka) worn on expeditions. The models with a rubber watch band don’t have this problem as these types of bands can be adjusted. A recommendation to Casio is to make the metal bands with an extension, like dive watches do to adjust for wetsuits. 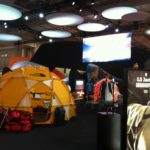 Expedition Features. Need to know what time the sun is going to rise over a temple in Bhutan? The Casio Pro Trek PRW3500T-7 will tell you; this watch is full of nice to have features for when you are adventuring across the globe or just across the country. Other features include; water resistant to 200m, world time in 31 time zones, sunrise/sunset data, stopwatch, auto calendar through 2099, five daily alarms, battery power indicator, and an incredible battery that will last for seven months on a single full charge. Durability. The durability of the watch was tested through first-rate abuse. I conducted the throw test against volcanic rock – not a scratch or impairment of functionality. I wore it rock climbing and it performed without a hitch. 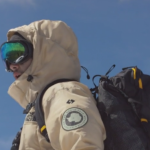 Finally, I used the Casio Pro Trek PRW3500T-7 in extreme weather conditions while ice axing my way across a glacier and it performed like a champ…well, like a Casio.